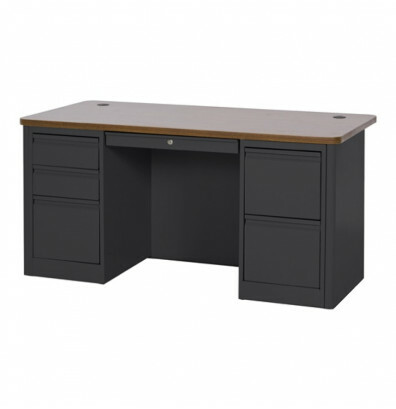 Sandusky 900 Series 60" W teacher desk offers a durable laminate top with rounded corners. Features two pedestals with two box and three file drawers and a center drawer. Available in multiple finishes. Dimensions: 60" W x 30" D x 29.5" H.
Sandusky 900 Series 60" W teacher desk offers a durable 1.25" thick wood-grain laminate top with rounded corners and vinyl covered t-mold edges. One file / file and one box / box / file pedestal holds office supplies and hanging file folders. Includes two wire grommets in the desk surface for easy cable management. Double-wall steel end panels with smooth radius edges creates a strong solid frame. Ships ready to assemble. 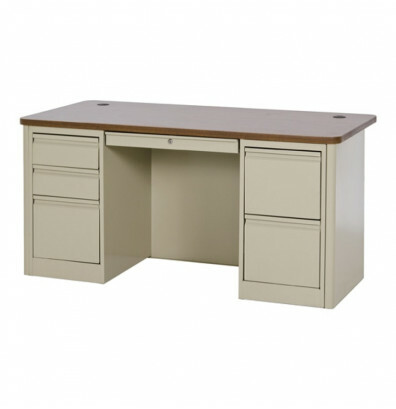 The 900 Series 60" W teacher desk features two pedestals for storage convenience. All drawers have full width recessed pull handles and heavy duty steel ball-bearing slide suspension for easy opening and closing. 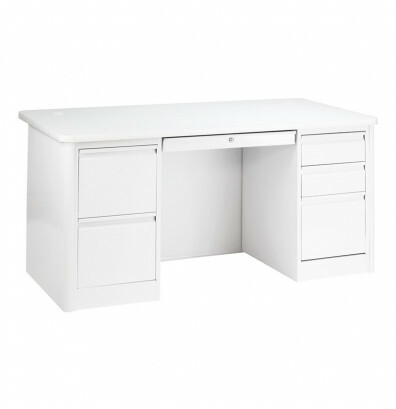 A full width center drawer with supply tray has an upgraded central locking system which locks all drawers. Includes a set of two keys. Four adjustable leveling guides. 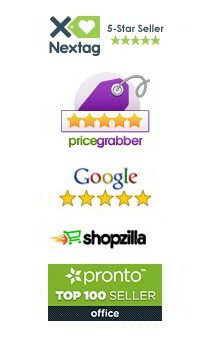 Greenguard certified for low chemical emissions. Two box drawers for office supplies. The filing drawer accepts letter, legal, and A4 files. Two filing drawers accept letter, legal, and A4 files. Product requires assembly. Hardware included.